I have been to Brecon Estate on the west side of Paso Robles a couple of times but truthfully didn’t know that much about them. This Q&A allowed me to get to know and understand Brecon and the co-owner, Damian Grindley, much better. The back story is quite cool. You can learn more at their website but first, let’s dive into these answers from Damian and his wife, Amanda. Matt: If you weren’t in the wine industry, what would you be doing? 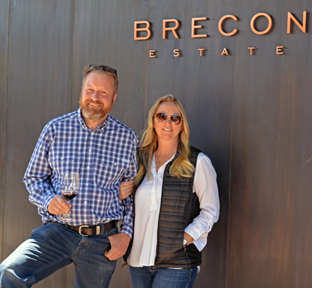 Brecon Estate: After three eventful decades in the industry, we really don’t know what else we would be doing now that we are so entrenched in wine. Damian has a mountain of cave surveys from his various overseas explorations to draw up. Consequently, it’s easy to see him locked in some remote mountain hut diligently drafting away. Matt: What interests/ hobbies do you have outside of the wine world? Brecon Estate: We are cave explorers at heart. For some reason, we find deep satisfaction and escapism in scrabbling around in damp miserable holes in the ground. It’s definitely not something your mother would approve of. The phone does not ring and there is no email. If you are scared of the dark, of drowning, of heights or are claustrophobic just forget it. Incidentally, many cave regions are on limestone foundations and there you have the link in a nutshell. Matt: What is your favorite wine region not including Paso Robles? Brecon Estate: The limestone coast in Australia. Simple because it produces excellent wines and has the added attraction for us of a world heritage cave and fossil site. Amanda for the old fossils, Damian for the caves. Matt: What’s your current favorite wine/ variety/ winery to drink? Brecon Estate: It changes with the time of day, season, the environment and of course as we age gracefully ourselves. When we discover something that really blows us away, we like to explore around that variety or region. Paso Robles Tannat is fascinating at present as new vineyards come online. The same can be said for Central Coast Albarino as those vineyards reach full maturity. In the past, New Zealand Sauvignon Blanc or Barossa Shiraz has been our go-to wines. Matt: What is your favorite aspect of the wine business? Brecon Estate: It changes every year. Mother nature throws different curveballs at you each vintage. Keeps you on your tippy toes. Keeps you alive. Matt: How about least favorite? Brecon Estate: Most people can relate to the paperwork mountain. With wine, each US state has its own rules and it’s almost like dealing with separate countries. It compounds the paperwork and completely unnecessary. Matt: How long have you been in the industry? Brecon Estate: You are really going to make us feel old now. The year would have been 1989. It makes Damian a venerable veteran of the wine industry. Amanda would still have been in High school at the time! Of course, we are still young at heart. Matt: What different parts of the wine industry have you worked in? Brecon Estate: I worked in wholesale and retail in the competitive UK drinks market prior to studying for my formal wine-making qualifications. This gave me a fantastically broad understanding of the global wine industry and has held him in good stead to this day. Matt: Where are you from originally? Brecon Estate: A small, unpronounceable village on the wild, windswept Welsh Isle of Anglesey was Damian’s home for his formative years. In no way can it be considered wine country. Amanda, however, grew up among majestic vines as the southern suburbs of Adelaide slowly overtook many historic vineyards. Matt: How long have you been in the Paso Robles area? Matt: How many vintages have you worked? Brecon Estate: Graduated in 1997 but for many years was doing both a Southern and Northern hemisphere vintage. Two per year. So, I guess it’s north of twenty-five vintages. Come to think of it, that’s a little scary. Matt: What was your first job in the industry? Brecon Estate: Driving a van and advising customers on wine selections for Majestic Wine Warehouses in the UK., wholesalers to the public. They are still going strong. Matt: What is your first wine memory? Brecon Estate: My dad’s homebrew, Elderflower champagne, exploding in the garage as it, unfortunately, went through uncontrolled malolactic fermentation in the bottle. Pretty impressive and very, very messy. Arguably this is what set Damian on the winemaking track in later life. Matt: Favorite part about Paso? Brecon Estate: Fog, fog and more fog rolling in of an evening cooling down Damian’s blue British blood. It makes him so, so much happier. The grapes thrive on it as well as it mimics air-conditioning while they are sleeping and lets them get fully rested for the next day. Matt: Least favorite part about Paso? Brecon Estate: Hailing from the UK, Damian enjoys a damn good Indian curry with Brecon Albarino. It’s really a Brits soul food these days with around 30,000 Indian restaurants to choose from. Here in Paso we are currently in a veritable curry desert. Matt: Where do you see the industry in the Paso Robles region going? Brecon Estate: Do you see any interesting new trends or directions? I really want Paso Robles to do its own thing not be behooves to some old-world combination of grape varieties or definition of styles. Paso can be so much more than that with its myriad microclimates. It should be known for what Paso does best whether it be Petit Verdot or Cabernet franc and not feel it has to do something such as chardonnay or sauvignon blanc just because that is what they do elsewhere. Matt: When you’re not drinking wine, what’s in your glass? Brecon Estate: Damian is a hard cider drinker. He drinks it all of the time. Keeps his wine palate clean so he says. Whereas Amanda really likes her bubbles and has been trying to persuade Damian to make some for at least the best part of a decade. Matt: What are some of your favorite food and wine pairings? Brecon Estate: A roaring fire, a winter snowstorm, a varied charcuterie plate and perhaps something with a little higher octane such as a rich fully ripe Petite Sirah. Of course, all with the hounds curled up at my feet. Hmmm, suspect that’s a long shot with a charcuterie plate in easy muzzle reach. Well at least with my dogs. Matt: Why do you think Paso Robles has become such a big wine destination? Brecon Estate: Location, Location, Location. Calcareous soils, cooling marine layers, suitable rainfall, a super long dry growing season, fantastic microclimates, Stunning vistas and an eager wine buying populous within 2-3 hours of Paso. Not to mention the talented professional winemakers and chefs crazy enough to call Paso Robles home. Matt: How many acres of vines do you have? Brecon Estate: Twenty-seven acres of the forty-acre property are planted mostly to Bordeaux varieties. There are a few minor gaps at present as we bring in some fascinating clones to raise the quality bar inexorably higher in the near future. Matt: How many cases are you producing each year? Brecon Estate: Brecon is small and boutique and as owners, we have no intention of expanding into retail outlets all over the state. Rather they are growing organically as folks gravitate towards us. They are generally too polite to mention how minuscule their case production is. However, I suspect you can work it out. If they are making 12-14 small parcels of wine a year with an average run size of say 350 cases would be pretty close to the ballpark. We definitely need to get back out there again, but it’s been great whenever we’ve had their wines!